Craft beer may still be riding a wave of growth worldwide, but sometimes only a pint of cheap suds will do. At the end of 2017 the average pint of bitter rose above £3 for the first time in history, while lager now sits at £3.58, according to the Good Pub Guide. Drinks giants Molson Coors and AB InBev have both confirmed their beer prices will rise this year, citing pressure and uncertainty in the UK economy as Britain makes its departure from the European Union. But while drinks prices in the UK are getting steeper, summer holiday season is on the horizon, and new research shows there are still plenty of places in the world where you can get more milage out of your money. In the UK, it is not uncommon to pay around £4 for a pint of beer, according to price comparison site Money Guru, which has published a new study analysing the cost of a pint in more than 30 cities worldwide to determine where your money will stretch furthest this year. The study compared the average cost of a UK pint measure (568ml) in bars and pubs across 32 destinations at the end of April 2018, and also looked at the amount you can buy for £4, throwing up some unexpected results. 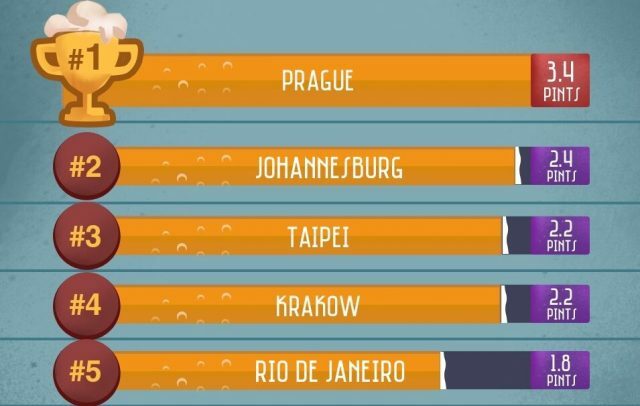 While budget-friendly cities such as Prague, Krakow and Bangkok made it into the top 10, a number of locations were also recognised for their reasonable mark-ups on beer, including Vienna and Tokyo. From Barcelona to Berlin, here are the 17 cheapest places to find a pint in the world right now.